Tough Boris is an Australian/American pirate picture book. As fodder for stories, ocean piracy has never yet been out of fashion. Especially in stories aimed at boys, the pirates of modern picture books are often comical rather than scary; jovial rather than evil. Pirate stories bear little to no resemblance to the actual crime of piracy, which is alive and well in the world today. What is the allure of pirates, and what kind of stories can they tell the modern reader? In this particular story, ‘pirate’ is a visual metaphor for ‘masculinity’. This is the age of the antihero; for adults see Mad Men, Breaking Bad, The Wire etc. 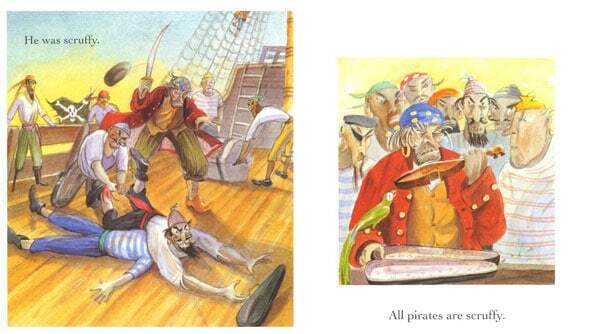 This picturebook breaks down the dichotomy between pirates and heroes. As is increasingly common in high quality modern picturebooks, a very simple text is complemented by a series of illustrations which depict the bulk of the narrative. The text simply lists a number of attributes of a pirate called Boris von der Borch. The illustrations tell the story of the time the pirates went shore to search for hidden treasure. (They have a map.) The pirates find a boy on shore and steal his violin. It’s not clear how the child gets onto the pirate ship afterwards — perhaps the pirates stole the boy as a slave, or perhaps the child somehow managed to find his own way onto the ship (less likely, perhaps?) but either way, we see the child looking on as the pirates scuffle and fight, not knowing what the violin is for. The child stowaway breaks into Boris’s cabin one night and takes it back, seeking refuge below deck until he is found by a hoard of scary-looking pirates. When the boy plays the violin for the pirates he is accepted as one of the passengers. Then, Boris’s beloved green parrot dies of unknown causes. The violin case is used as a coffin for the parrot, then ‘buried’ at sea. Boris gets one of his worker pirates to row ashore in a dinghy. But this trip is also to return the stowaway to the shore. After enjoying his time onboard the pirate ship, bonding with the scallywag pirates, getting to know what they’re like, he is now abandoned, alone once again on a beach. Boris has given the boy back his violin, perhaps because he will always be reminded of his beloved parrot if he were to keep the violin, and the boy. I didn’t really like this book at first. But it fit well for our pirate book club parties. Then after I read it for the tenth (or so) time, I discovered that I really liked the tender story told in the pictures and not in the actual words. [T]his is a story for young little kids, like my nephew, who think pirates are cool. Pirates are all tough, pirates are all massive, pirates are all scary, pirates are all scruffy. Little kids get that, and agree with it. That is a pirate as little kids know him. The word story was the one my nephew was responding to. Tough Boris is also a story for older kids, but *that* story is told through the pictures, and that story is more complex and more suspenseful than the story told in words. The story in the pictures is the one that my eight year old niece was tuned in to. Where the two stories, merge, though, is in the end, and that ending is appropriate to both the word story and the picture story. 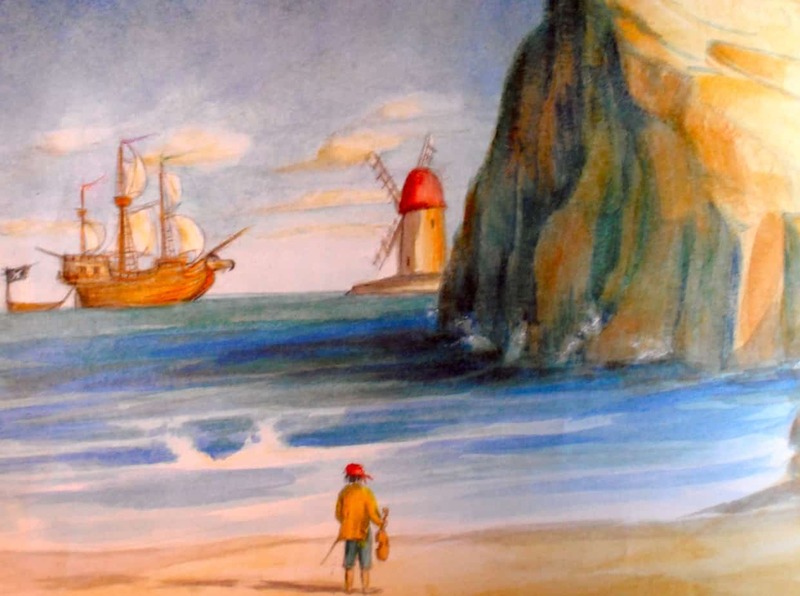 This is the case for any unlikely picturebook narrative, but one interpretation is that this entire story is the wish fulfilment of a lonely boy who plays on the beach, wishing some pirates would turn up. The stereotypical dress and characterisation of the pirates, from the golden hoop earrings to the eye-patches to the parrot on the shoulder all point to a scenario which has been wholly imagined. 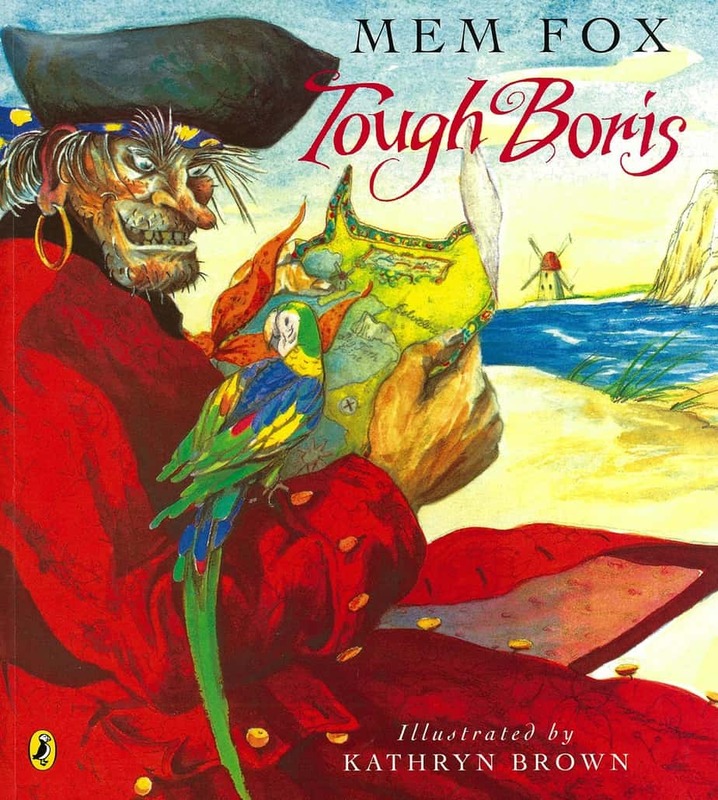 We see some juxtaposition in the illustrations — Tough Boris wears traditional pirate garb (as do all of the pirates) but if you look closely at the pattern on his red coat, you’ll see it is embroidered in flowers, which would look perfectly at home on the apron of a kindly grandmother. Although he has the typically haggard face of a fairytale pirate, he gazes lovingly into his parrot’s eyes. He is more interested in the parrot than in the treasure map held before him. His smile is part grimace, but a smile nonetheless. Boris seems less tough than he might otherwise in juxtaposition with the other pirates, who we never see smiling. It seems it wasn’t actually Boris who stole the violin, but the pirate with the eye patch and the blue and white stripes. Boris has been canoodling with his parrot all the while. It’s not Boris who holds the pirate flag. Boris stands around, or out of the action, much like the boy. We see Boris in pyjamas (a slightly vulnerable state of dress) but the other pirates are always ‘in costume’. The boy’s integration into the world of the pirates is symbolised by the red kerchief, which he first wears around his neck, then ties around his head, pirate-style. The young reader is encouraged to identify with the child character, not just because the character is a child, but because of the point of view of some of the illustrations. We see ‘over-the-shoulder’ shots (or versions thereof) first on the aforementioned colophon page, with the boy sitting on the hanging rock, looking out to sea, and again on the ‘He was greedy’ page, in which the boy is high up at the top of a mast, looking down onto the deck as we do. On the following page, the haggard, evil, Tough Boris seems somehow vulnerable, clutching such a delicate object as a violin, not knowing what it is for but nevertheless treasuring it. “All pirates are greedy,” we read on the following page, as we see the boy take the violin. The boy, too, is ‘greedy’ (insofar as one can be greedy, taking back one’s own property). The boy is now a pirate. We have seen him two pages back untying his red kerchief from around his neck, and next time we see him (peeking out from the stairs leading below deck) he has fastened it around his head. The parrot joins the boy below deck, as a bridge between the world of the pirates and the lonely life of the boy. The loop of noose-like rope hanging from the ceiling below deck seems portentous after we know the fate of the green parrot. The parrot sort of saves the boy from the swipe of Boris’s sword by coming between them. We don’t know how much time passes before the parrot dies. When we learn the parrot has died, we are shown a long shot of the ship, when all of the proceeding scenes have been medium shots and medium close-ups of life onboard. Death is bigger than anything we know or can depict — the long shot is therefore a good choice. Not only that — the metaphor of ‘out to sea’ springs to mind, as a description of the state of mind of the recently bereft. It is the boy who approaches the pirate in his grief, and supposedly offers the violin case as a coffin. The pirate and the boy are shown with matching body language — heads down, slumped. The boy is halfway through the door — he is halfway to becoming a pirate, with Tough Boris as a father figure. Of course, he doesn’t quite make it. He is abandoned onshore. Notice the large ship with the dinghy being towed behind it — a father/son metaphor. The message of this picturebook comes through loud and clear: Fathers cry, not just sons. Feelings of abandonment and loneliness and grief are good reasons to cry. Published by Puffin in 1994. Mem Fox is one of Australia’s best known children’s book authors and literacy experts, perhaps most famous for Possum Magic, published in 1978 and which has since become an Australian childhood classic. By the time she wrote Tough Boris she had already published about 20 picture books. Illustrator Kathryn Brown is American, making this an Australian/American collaboration. Brown has illustrated a number of picture books as well as written her own. Here is a list of kidlit about pirates from CLCD, including books for older readers, not just picturebooks. Pirate Jenny by Nina Simone. The lyrics are about a scrubber woman from the south who dreams of ruling the world by becoming a pirate and killing the people who keep her in her place. Her imagination helps her get through the day, where she is told to get on with her scrubbing. Pirates wore eye patches to keep one eye accustomed to the darkness below deck. Pirates didn’t actually talk like that. Photos of a pretty cool pirate themed bedroom. My take on the film Pirates: Band of Misfits! in which gender roles are reinforced rather than challenged.